Maria Sklodowska-Curie (born in Warsaw, on November 7, 1867) was one of the first woman scientists to win worldwide fame, and indeed, one of the great scientists of this century. She had degrees in mathematics and physics. Winner of two Nobel Prizes, for Physics in 1903 and for Chemistry in 1911, she performed pioneering studies with radium and polonium and contributed profoundly to the understanding of radioactivity. Perhaps the most famous of all women scientists, Marie Sklodowska-Curie is notable for her many firsts. She was also the first female lecturer and professor at the Sorbonne University in Paris (1906). In 1911, she won an unprecemlented second Nobel Prize (this time in chemistry) for her discovery and isolation of pure radium and radium components. She was the first person ever to receive two Nobel Prizes. From childhood she was remarkable for her prodigious memory, and at the age of 16 she won a gold medal on completion of her secondary education at the Russian lycée. Because her father, a teacher of mathematics and physics, lost his savings through bad investment, she had to take work as a teacher and, at the same time, took part clandestinely in the nationalist "free university," reading in Polish to women workers. At the age of 18 she took a post as governess, where she suffered an unhappy love affair. From her earnings she was able to finance her sister Bronia's medical studies in Paris, on the understanding that Bronia would in turn later help her to get an education. In 1891 Marie Sklodowska went to Paris and began to follow the lectures of Paul Appel, Gabriel Lippmann, and Edmond Bouty at the Sorbonne. There she met physicists who were already well known--Jean Perrin, Charles Maurain, and Aimé Cotton. Sklodowska worked far into the night in her students'-quarter garret and virtually lived on bread and butter and tea. She came first in the licence of physical sciences in 1893. She began to work in Lippmann's research laboratory and in 1894 was placed second in the licence of mathematical sciences. It was in the spring of this year that she met Pierre Curie. Their marriage (July 25, 1895) marked the start of a partnership that was soon to achieve results of world significance, in particular the discovery of polonium (so called by Marie in honour of Poland) in the summer of 1898, and that of radium a few months later. Following Henri Becquerel's discovery (1896) of a new phenomenon (which she later called "radioactivity"), Marie Curie, looking for a subject for a thesis, decided to find out if the property discovered in uranium was to be found in other matter. She discovered that this was true for thorium at the same time as G.C. Schmidt did. Turning to minerals, her attention was drawn to pitchblende, a mineral whose activity, superior to that of pure uranium, could only be explained by the presence in the ore of small quantities of an unknown substance of very high activity. Pierre Curie then joined her in the work that she had undertaken to resolve this problem and that led to the discovery of the new elements, polonium and radium. While Pierre Curie devoted himself chiefly to the physical study of the new radiations, Marie Curie struggled to obtain pure radium in the metallic state--achieved with the help of the chemist A. Debierne, one of Pierre Curie's pupils. On the results of this research Marie Curie received her doctorate of science in June 1903 and, with Pierre, was awarded the Davy Medal of the Royal Society. Also in 1903 they shared with Becquerel the Nobel Prize for Physics for the discovery of radioactivity. The birth of her two daughters, Irene and Eve, in 1897 and 1904 did not interrupt Marie's intensive scientific work. She was appointed lecturer in physics at the École Normale Supérieure for girls in Sévres (1900) and introduced there a method of teaching based on experimental demonstrations. 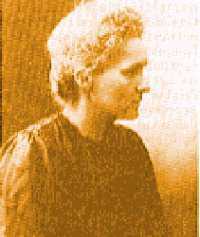 In December 1904 she was appointed chief assistant in the laboratory directed by Pierre Curie. The sudden death of Pierre Curie (April 19, 1906) was a bitter blow to Marie Curie, but it was also a decisive turning point in her career: henceforth she was to devote all her energy to completing alone the scientific work that they had undertaken. On May 13, 1906, she was appointed to the professorship that had been left vacant on her husband's death; she was the first woman to teach in the Sorbonne. In 1908 she became titular professor, and in 1910 her fundamental treatise on radioactivity was published. In 1911 she was awarded the Nobel Prize for Chemistry, for the isolation of pure radium. 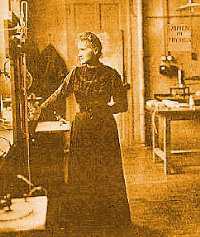 In 1914 she saw the completion of the building of the laboratories of the Radium Institute (Institut du Radium) at the University of Paris. Throughout World War I, Marie Curie, with the help of her daughter Irène, devoted herself to the development of the use of X-radiography. In 1918 the Radium Institute, the staff of which Irène had joined, began to operate in earnest, and it was to become a universal centre for nuclear physics and chemistry. Marie Curie, now at the highest point of her fame, and, from 1922, a member of the Academy of Medicine, devoted her researches to the study of the chemistry of radioactive substances and the medical applications of these substances. In 1921, accompanied by her two daughters, Marie Curie made a triumphant journey to the United States, where President Warren G. Harding presented her with a gram of radium bought as the result of a collection among American women. She gave lectures, especially in Belgium, Brazil, Spain, and Czechoslovakia. She was made a member of the International Commission on Intellectual Co-operation by the Council of the League of Nations. In addition, she had the satisfaction of seeing the Curie Foundation in Paris develop and the inauguration in 1932 in Warsaw of the Radium Institute, of which her sister Bronia became director. 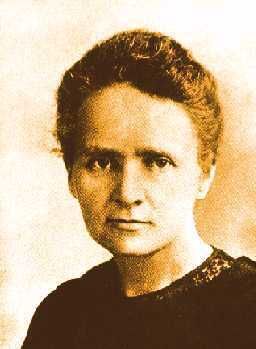 One of Marie Sklodowska-Curie's outstanding achievements was to have understood the need to accumulate intense radioactive sources, not only for the treatment of illness but also to maintain an abundant supply for research in nuclear physics; the resultant stockpile was an unrivaled instrument until the appearance after 1930 of particle accelerators. The existence in Paris at the Radium Institute of a stock of 1.5 grams of radium in which, over a period of several years, radium D and polonium had accumulated, made a decisive contribution to the success of the experiments undertaken in the years around 1930 and in particular of those performed by Irene Curie in conjunction with Frederic Joliot, whom she had married in 1926. This work prepared the way for the discovery of the neutron by Sir James Chadwick and above all the discovery in 1934 by Irene and Frederic Joliot-Curie of artificial radioactivity. A few months after this discovery Marie Curie died as a result of leukemia caused by the action of radiation. Her contribution to physics had been immense, not only in her own work, the importance of which had been demonstrated by the award to her of two Nobel Prizes, but because of her influence on subsequent generations of nuclear physicists and chemists. "My mother was 37 years old when I was born. When I was big enough to know her, she was already an aging woman who had reached the summit of renown. And yet it is the 'celebrated scientist' who is strangest to me - probably because the idea that she was a 'celebrated scientist' did not occupy the mind of Marie Curie. It seems to me rather, that I have always lived near the poor student, haunted by dreams, who was Marie Sklodowska long before I came into the world." On July 4, 1934, near Sallanches (France), Maria Sklodowska-Curie died of leukemia, caused by her exposure to the radium that made her famous. In 1995 Marie Sklodowska-Curie's ashes were enshrined in the Panthéon in Paris; she was the first woman to receive this honour for her own achievements. Citation: Scientist, discoverer, and author of international reputation, significant figure in the development of the new science of radioactivity, Nobel laureate both in 1903 and 1911, discoverer of the new elements polonium and radium; for these services and especially for the new insight which your discoveries have given into the nature of matter, and the new stimulus which they have been to the development of human thought. Forum for "Marie Curie Fellowship Association"